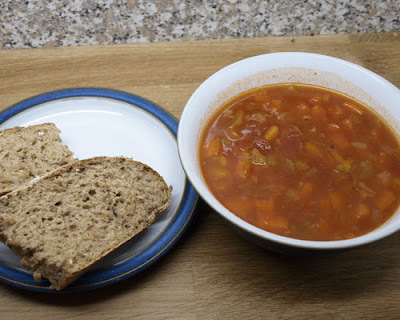 Lisa at 'We Don't Eat Anything With a Face' put out a National Vegetarian Week Challenge to us meat eaters, to adapt a meat/fish based recipe and make it vegetarian. 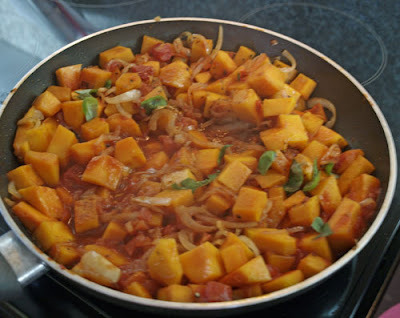 I like to eat meatless sometimes, but it took a bit of thinking what I was going to do with my Butternut Squash that wasn't a veggie recipe, it usually goes into risotto. Eventually I settled on making Butternut Squash Lasagne. 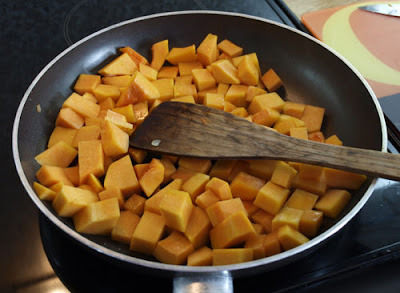 Saute the onions and butternut squash in the oil until the squash has some nice brown edges, you may need to do this in two batches. Add the can of tomatoes and the herbs and simmer for about 10 minutes. Meanwhile make your bechamel sauce. I've highlighted the video on BBC Good Good website, but you can use any recipe. I don't faff around with bay leaves and butter, but generally make my sauce with cornflour (there is usually a recipe for a white sauce on the packet), not so flavourful, but quicker and pretty well guaranteed not to go lumpy. Then layer up, first a layer of the butternut squash mixture, then lasagne, then more butternut squash, another layer of lasagne and finally some more butternut squash. Then pour over the sauce and cover with the grated cheese. 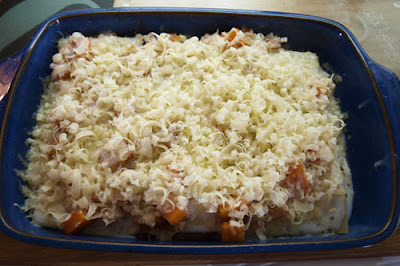 Bake in the oven at 170 C (fan oven), for about 30 - 40 minutes until it is bubbling and the cheese is nicely browned. These quantities will serve 6. 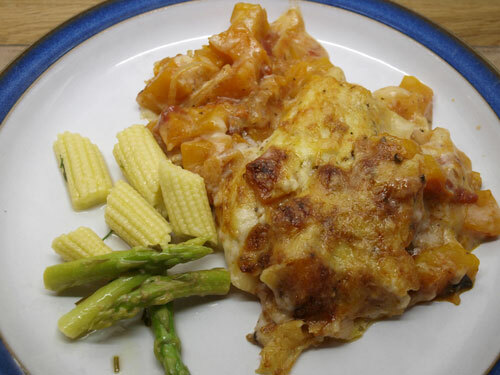 I served the lasagne with baby sweet corn and asparagus steamed with butter and fresh thyme. The lasagne was creamy and delicious, the sweetness of the squash contrasting nicely with the acidic tomatoes and the salty cheese. 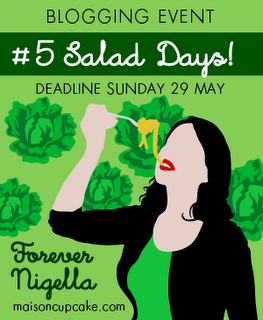 I've missed a couple of Forever Nigella challenges, but I'm back for the salad event which is being hosted by Belleau Kitchen for Maison Cupcake. Not that we are having salad weather here, as I look out the window all I can see is rain streaming down the window, it's grey and cold too, more like autumn. 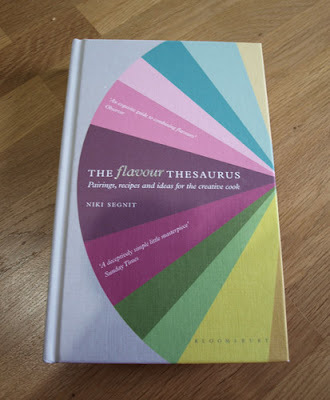 So I had a look through my Nigella books and decided on a recipe which I've looked at a few times but never quite got round to. It's in 'Forever Summer' and is the 'Rainbow Room's Carrot and Peanut Salad'. 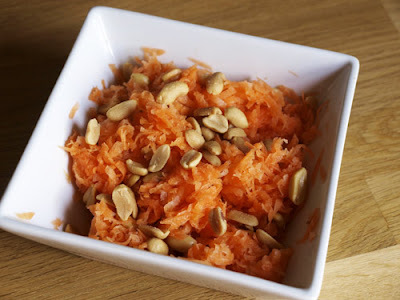 Nigella's carrots are cut much more roughly, but I only have a fine microplane grater, so it had to do. I don't normally have peanuts in the house (because I will just eat them!) but I bought some of Tesco's value peanuts and they were very good and not very expensive. Other than that, it's just a bit of dressing, I used the last of my Fig vinegar that I got on holiday last June, the fruity flavour worked really well with this salad, which I ate for my lunch. You only need a couple of drops of oil as the oiliness of the peanuts works really well with the vinegar. Luckily for everyone, Nigella has posted this recipe on her website HERE. I picked up a copy of the June BBC Good Food Magazine at the station last week and was immediately drawn to this simple recipe for a Family Fruit teabread. 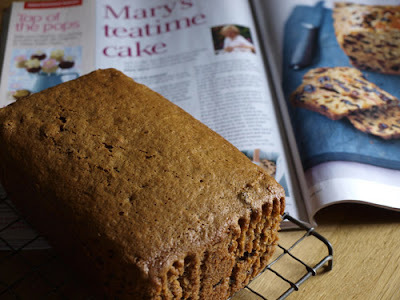 It comes from Mary Berry's book My Kitchen Table: 100 Cakes and Bakes by Mary Berry. I own quite a few Mary Berry books, mostly bought in the 1980s. 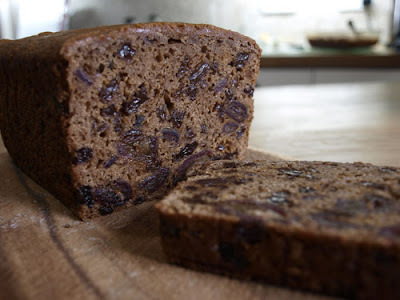 I have to say that I have many similar tea loaf recipes but I don't think that I've ever seen a more even looking tea loaf, it is a masterly recipe. 300ml/1/2 pt hot Assam Tea, made with two tea bags. Put the dried fruit and sugar in a bowl and pour over the hot tea. At this point you are supposed to leave it overnight to soak up the tea, but I didn't have time, so mine got 2 hours and was still pretty wet. Line a 900g/2lb loaf tin with baking parchment or one of those clever loaf tin liners you can buy from Lakeland. Add the flour, lemon zest and beaten egg and stir iwth a spoon till mixed through. My mixture was still quite wet, so I poured it into the tin. Bake for 11/4 to 11/2 hrs or until it is well risen, firm to the touch and a skewer inserted in the centre comes out clean. Peel of the baking paper or liner and serve sliced with or without butter - mine didn't need any butter it was so moist and deliciously stuffed with fruit. And so to the Fairy Hobmother, if you haven't heard of this phenomenon, then listen up! The Fairy Hobmother grants wishes to good food bloggers. She lives at Appliances Online , who sell cookers and other white goods and hangs around food blogs looking out for people to help. Here is what I got from the Fairy Hobmother, I've been eyeing it up for some time and this was just the excuse I needed. The only drawback I can see is that the writing seems tiny, however as it is a 'dipping into' book I'm hoping that that isn't going to put me off. I'll report back when I've had a proper look. If you would like a gift from the Fairy Hobmother, leave a comment saying what it is that you would like and maybe you will get a visit. 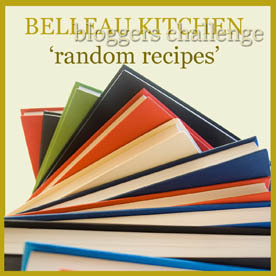 The Random Recipe challenge at Belleau Kitchen challenges you to dip into your cookery book collection and randomly pick a recipe on a particular theme. This is what Dom says "the rules are simple... take all your dessert, chocolate, cake, sweet or pudding based cook books, place them in a pile and randomly select one book... from this book, flip it open to a random page and bake that exact recipe.."
I have a lot of cookery books, so I picked out 12 that contain dessert recipes and piled them up, then I did a random number generator and it came out with number 9. Number 9 was Seasonal Cookery by Claire Macdonald of Macdonald. Claire Macdonald is probably one of the best dessert recipe writers I know, her Chocolate Pavlova is beyond belief and her Bramble Mousse is divine. But this had to be random. The difficulty with this book is that the desserts are not all at the end of the book as it is organised by month! So it took me a few random openings to find a dessert. It turned out to be in July and was a simple 'Strawberries with Lemon Syllabub'. 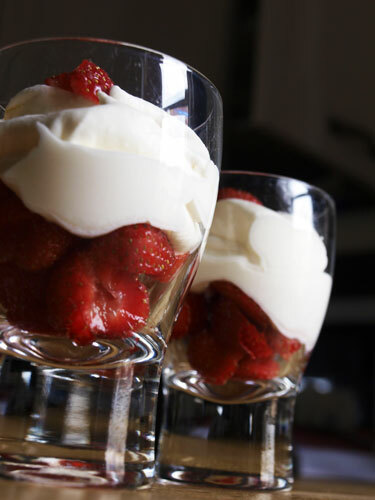 It is the start of strawberry season so ideal for this recipe which was absolutely delicious, the sweetened cream with lemon juice and rind as well as a little wine was the perfect complement to the strawberries. I can thoroughly recommend it! Slice the strawberrries and divide between 6 glasses. Whip the cream, gradually adding the lemon juice, rind, white wine and sugar. When the cream mixture is thick, spoon over the sliced strawberries in the glasses, and stir the strawberries up through the lemon syllabub. Chill several hours before serving. We had this over two evenings and the syllabub was definitely better on the second night when the lemon flavour had really merged with the cream, so I would recommend a long chilling time. What do you have in the bottom of your fridge? I always seem to have some rather limp looking vegetables that I should have used last week or maybe even the week before . In the winter I make a big pot of soup every weekend, but as the weather gets warmer and the nights get lighter I drift away from soup. However, when I saw that the carrots were starting to look a bit dodgy and the celery going slightly limp I knew it was time to act! 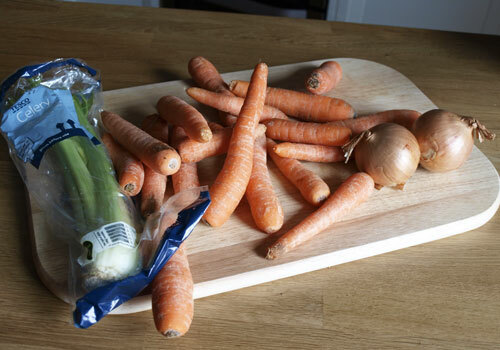 I peeled the carrots and onions and, along with the celery, chopped them up and sweated them in a little oil over a low heat. 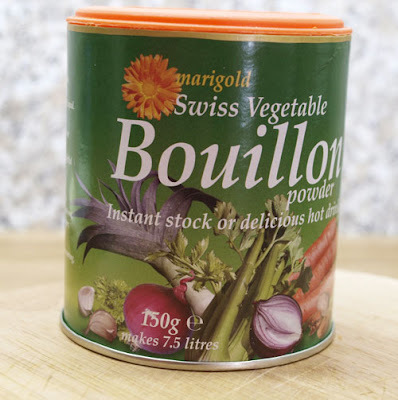 Marigold Bouillon is magic stuff and a tablespoon of the powder in a big pressure cooker of liquid really brings out the flavour. The stock powder went into the pot with a kettle full of boiling water and two tins of chopped tomatoes. 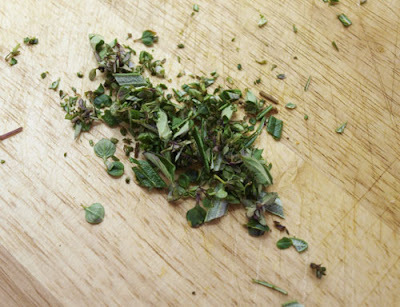 One of the nice things about the warmer weather is that the herbs are coming on nicely and I just have to pop out of the back door to snip a few bits and pieces, in this case rosemary, thyme and marjoram, to add to the soup. So there it is then. I made a granary loaf, mixing the dough in the bread maker and baking it in the oven to create a nice rustic loaf. It made a perfect lunch. So tell me...what do you do with those bits that end up at the bottom of your fridge? I'm still a little obsessed by Rachel Allen's 'Home Cooking' and checked to see what she had done with rhubarb. 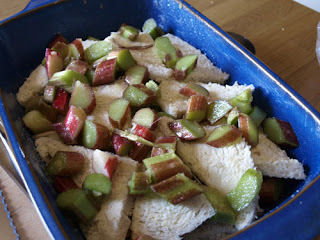 If you have been following my blog you will know that at this time of year I have an excess of rhubarb and I'm always looking for ways to use it. 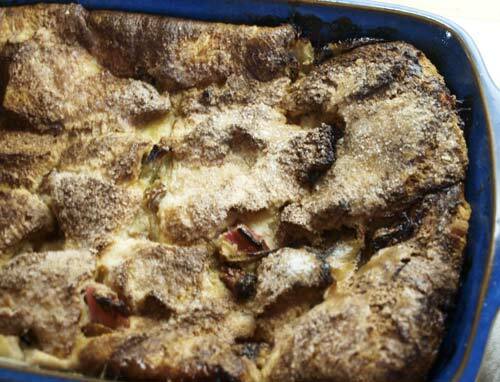 Anyway, back to Rachel and her Home Cooking, I liked the sound of this Rhubarb and Ginger Bread and Butter Pudding. It is almost summer, but there is still a cool wind blowing and some frost in the morning, so a nice warm pud is most welcome. 1. 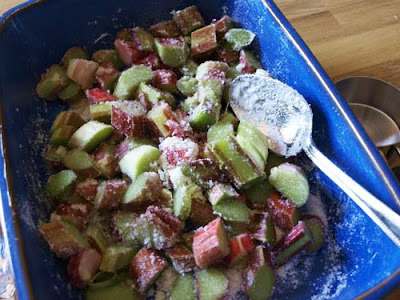 Scatter the rhubarb in a bowl and sprinkle with the grated ginger and half the caster sugar. Toss together and then leave to sit for about 30 minutes to soften a little. 2. Preheat the oven to 180C/350F. Gas mark 4. Butter the bread and arrange four slices, buttered side down, in the ovenproof dish. Scatter over half of the prepared rhubarb and top with four more slices of bread, again buttered side down. 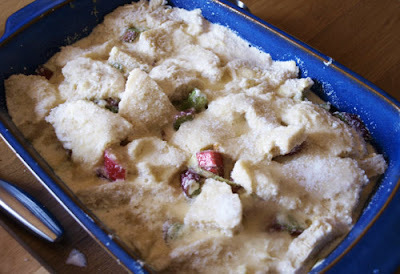 Repeat with the remaining rhubarb mixture and bread. 3. Place the cream, milk and grated ginger in a saucepan and bring just to the boil. While this is coming to the boil, whisk the eggs, salt and remaining caster sugar in a bowl. Continuing to whisk, pour the hot liquid into the egg mixture until well mixed. Slowly pour this custard over the bread and leave to soak for 10 minutes. Sprinkle the granulated sugar over the top. 4. 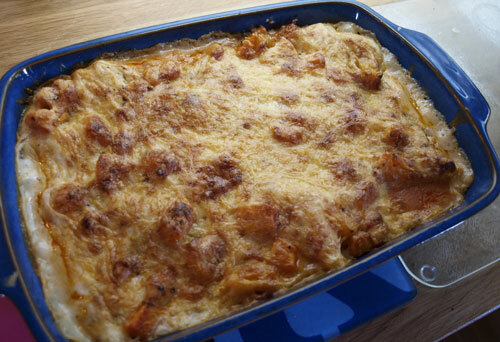 Rachel says to place the dish into a deep-sided baking tray and create a bain-marie with boiling water coming half way up the sides of the dish. 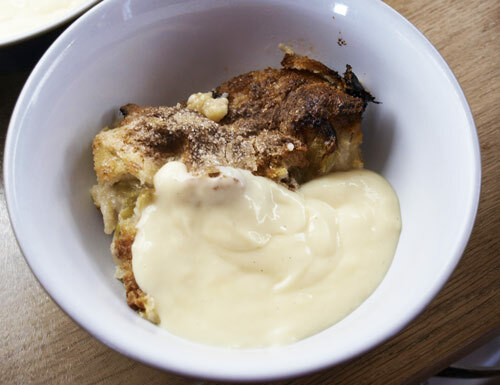 I didn't do this, I don't like soggy mushy bread and butter pudding, I like crispy topped, crunchy pud. So I dispensed with the bain-marie and just put the pudding on the shelf in the oven and baked for 45-50 minutes until it felt just set in the centre. Remove from the oven and serve warm with a light dusting of icing sugar (I didn't bother) and I served mine with custard, but Rachel recommends lightly whipped cream. This recipe is a real family favourite and I have lost count of the number of friends to whom I have passed on the recipe. My Mum found the recipe in a magazine she bought at the airport and it's one of those recipes ideal for entertaining as it is prepared in advance leaving the host or hostess relaxed to greet and entertain their guests. 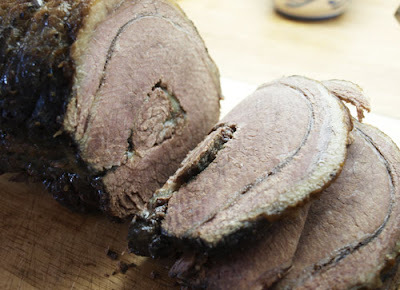 I wasn't doing any major entertaining, but had bought some brisket at the Farm shop and my SIL was coming for the weekend, so I thought it was a good excuse to make this recipe again. 1. In a 5 1/4 pint (3 ltr) heavy flameproof casserole with a lid, combine the beef, wine, brandy, 4 tbsp of the olive oil, the carrots, the bay leaves, celery, rosemary, crushed peppercorns and cinnamon stick. Stick a clove into each of the onion halves and add to the casserole. Cover and refrigerate for at least 12 hours or up to 24 hours. Turn the meat form time to time. 2. At least 2 hours before cooking the meat, remove the casserole from the refrigerator to bring the mat to room temperature. 3. Remove the meat from the marinade and pat dry. Pour the marinade into another container and reserve. Rinse and dry the casserole. 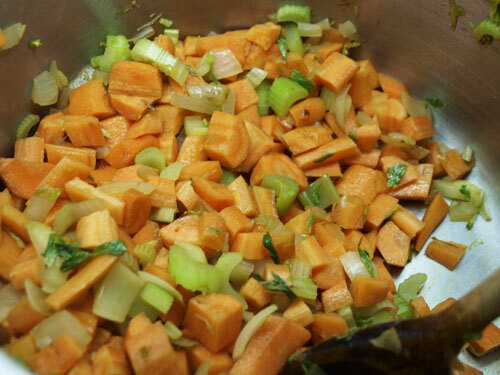 Add the remaining 3 tablespoons of olive oil to the casserole and heat the oil over a moderately high heat. When the oil is hot but not smoking, add the beef and brown evenly on all sides, 3 to 4 minutes per side. Season the beef generously with salt and pepper., Add the marinade to the casserole. 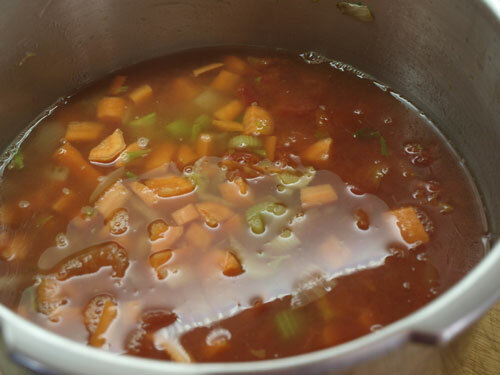 Bring just to a simmer, then reduce heat to very low and cover. Simmer gently until the beef is fork tender, about 3 hours. Turn the meat from time to time, and do not let much of the liquid evaporate. You should have about 8 fl oz (250ml)of liquid remaining for the sauce. Alternatively the beef may be sliced and refrigerated for one more day long with the sauce. Simply reheat at serving time. The meat is delicious and tender and also very good served cold with salad and baked potatoes.